Have you ever thought about the shapes of the food you eat? I thought of it while pondering these round salted snacks. I've noticed that there are fewer balls than sticks. This makes sense considering that "sticks" can be made merely by cutting up a larger mass. Balls have to be formed through some other process like using a mold. 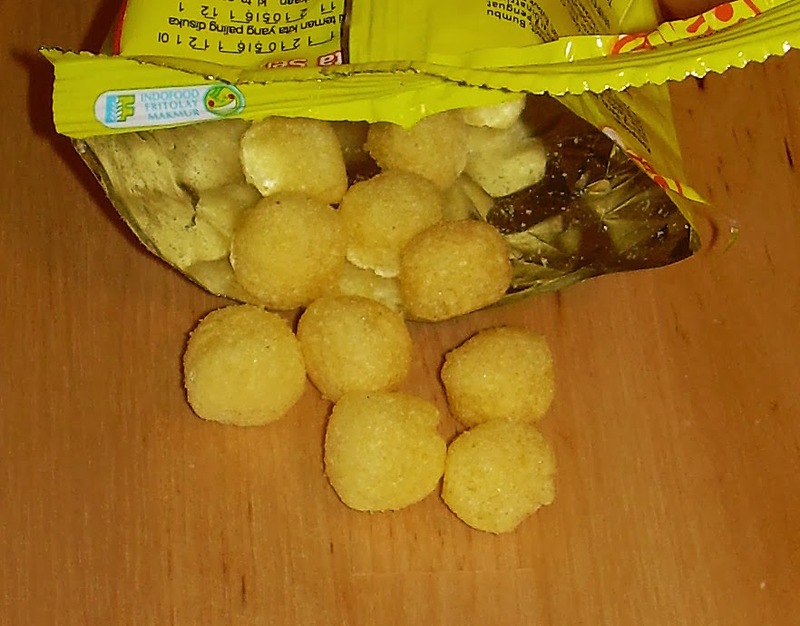 In fact, I have no idea how salted snack foods that are round are created, but my fevered imagination makes me think it must involve tiny little snack food fairies with sodium chloride dandruff who roll each morsel by hand and salt them with shakes of their disgusting heads. This is, I'm sure, part of what lead to the demise of the much loved Planter's Cheese balls. The advantage of balls over puffs is not only that the sphere is a perfect shape in nature and organically appealing to us mammals whereas sticks and doodles remind us of tree branches, but also that they provide more light and airy inner snack for an appealing texture. These are produced by an affiliated company of Frito Lay in Indonesia. Their web site says that they have chicken, cheese, and chocolate versions and they are produced under the strictest of quality control situations. If that is so, and I'm sure it is, I'm not sure why they smelled like diseased feet smothered in chemicals meant to cure them when I opened the bag. The smell didn't leap out and offend me, but I purposely try to get a sense of a food from the scent before I take a taste. Smelling these made me not want to taste them, but, this is my slave-wage-pay job, after all. I asked my husband to take a whiff of them as well and he found the smell as vile as I did. As I prepared to place a puff in my mouth, he said that I was very brave. With all of that build-up, one might expect that I just ate something incredibly vile, but the truth is that these were okay. They weren't great, but they were not the least bit offensive. 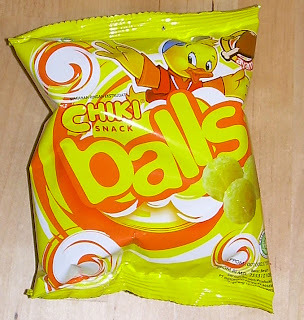 The balls themselves are exceptionally light and airy. The corn and rice base makes them taste a little like Cap'n Crunch without the sugar or hardness. They are also akin to "Kix" cereal without the crispy texture. The flavor other than the basic cereal one is very, very subdued. I expected to be blasted with some intense chemical powder, but the flavor is incredibly mild. It's has a whisper of salt and chicken boullion flavor. Clearly, these are designed for kids and I think that has a lot to do with how mild they are. Children have much more sensitive palates than adults and can't tolerate super strong flavors, at least not on the savory end of the scale. I think they can eat sugar straight out of the bag with little difficulty, but they hate vegetables (like onions) for a reason - at least sometimes. These are okay, but far too bland for me. I got them courtesy of KS Snacks so I can hardly complain about what I paid for them. They are interesting as a one-off experience, but I wouldn't try them again and, if I saw their other snacks at a store, I'd be inclined to give them a miss because they're not that impressive. I will give my benefactor a bit of a plug here though because they've changed their web site and are offering more snacks, a discount code for 10% off your order (KS 1), and are now listing prices in U.S. currency rather than Indonesia. There are more Japanese items on the front page (being sold in volume) as well as some interesting items like "red tea" and peach Pocky. hey, can you review the fujiya home pie? thank you! If I see them at one of the Asian markets I have access to, I shall do so, Murat!